This is a history of the Pike Place Market’s Rotary Grocery and of Eba’s Grocery’s first stores in the Main Arcade. Earl Eba returned to groceries in 1922, two years after his father committed suicide. 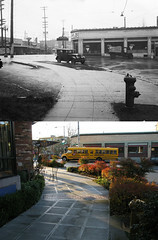 The first he opened was located behind the Rotary Bakery at the southern start of the Pike Place Market’s Main Arcade. It continued as an Eba’s Mutual Market and then Tradewell until the chain outgrew this space in 1945. 1503 Pike Place was occupied by a grocery store from the beginning of the Pike Place Market. Eba leveraged that in advertising to make it look like his store had been there continuously since in 1907. For example, a 1927 ad said that his father had started a store “about twenty years ago” but other ads referred to the storefront’s lineage, saying that “For twenty years the Eba store at 1503 Pike Place has been the grocery headquarters of thrifty housewives.” Regardless, there has been a grocery store operating in this space since 1907. After Eba’s successor Tradewell closed up this shop in 1945 it was turned into Rotary Grocery. In 1945 Rotary Bakery’s owner Walter Raleigh Taylor took over the grocery vacated by Tradewell and named it Rotary Grocery. Taylor’s parents Walter and Marie Taylor founded Rotary Bakery in 1919. The younger Taylor continued the stores until 1982 when he sold them and retired. The grocery was sold to Anthony and Chung Wong. Since 2006 it has been owned owned by Henry and Jane Kim. When I spoke to Mr. Kim I thought he said that he was the third owner, which would mean he purchased the store from the Wongs. However business license records show that Sae and Sang Song registered as Rotary Grocery in 2001. A few years ago, in about 2011, the building was remodeled to add an elevator. This cut the grocery store in half. Previously the registers were where the elevator lobby is today. Herman Eba’s actual first stand was further to the north, where City Fish is today at the foot of Pine Street. That store apparently opened in November 1908. The Main Arcade Building was completed in November 1907. Eba’s first trace was a May 1908 classified ad. He then appeared in the 1909 Polk guide with only residential information. The first clear evidence of the store was an ad from September 1910. However, Herman’s 1920 obituary said that he had a store “when the market building was first constructed”, which would indicate 1907. In a 1924 ad though, Earl Eba celebrated the 17th anniversary of the Main Arcade with a “Sweet Sixteen” sale for the birthday of Eba’s in the market. That means the store opened in late 1908. I believe the “Sweet Sixteen” ad is the clearest evidence and therefore believe 1908 is true. Because Eba was not listed in the grocery section I at first assumed that meant his store was not yet opened. However Pike Place Grocery also does not appear in the 1907, 1908 or 1909 Polk guide. I am positive it was opened in 1907. So for some reason the grocery listings despite being very long were not complete in the Polk guide.